Kick off your visit on the 4th (Sat): Head underground at Capo Caccia, then see some colorful creatures with a scuba or snorkeling tour, and then pause for some serene contemplation at Parrocchia del Sacro Cuore e San Marco. For maps, reviews, traveler tips, and other tourist information, you can read our Alghero trip app . Singapore, Singapore to Alghero is an approximately 21-hour flight. You can also do a combination of flight and train. You'll gain 7 hours traveling from Singapore to Alghero due to the time zone difference. When traveling from Singapore in May, plan for slightly colder days in Alghero, with highs around 26°C, while nights are cooler with lows around 13°C. Finish up your sightseeing early on the 4th (Sat) so you can travel to Venice. 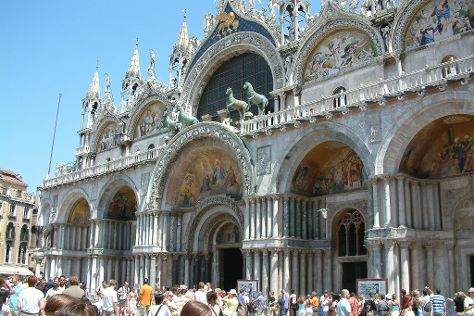 Start off your visit on the 5th (Sun): pause for some serene contemplation at Basilica di San Marco, pause for some serene contemplation at Basilica di Santa Maria della Salute, then snap pictures at Ponte dei Sospiri, then admire the landmark architecture of Doge's Palace, and finally get to know the fascinating history of St. Mark's Square. For other places to visit, maps, more things to do, and tourist information, read our Venice day trip planning tool . You can fly from Alghero to Venice in 4 hours. Alternatively, you can do a combination of flight and train; or do a combination of car and ferry. In May, daily temperatures in Venice can reach 26°C, while at night they dip to 15°C. Wrap up your sightseeing on the 5th (Sun) early enough to take a train to Florence. Kick off your visit on the 6th (Mon): see the interesting displays at Galleria dell'Accademia, then take an in-depth tour of Basilica di Santa Croce, then appreciate the extensive heritage of Centro Storico, and finally take in the spiritual surroundings of The Baptistery of St. John. Keep things going the next day: get to know the fascinating history of Piazza del Duomo, contemplate in the serene atmosphere at Cathedral of Santa Maria del Fiore, then admire the masterpieces at Uffizi Galleries, and finally explore by horseback at Maneggio Guelfi Neri - Passeggiate a cavallo nel chianti. To see where to stay, photos, and tourist information, read Florence route tool . Take a train from Venice to Florence in 2.5 hours. Alternatively, you can drive; or take a bus. In May, plan for daily highs up to 25°C, and evening lows to 13°C. 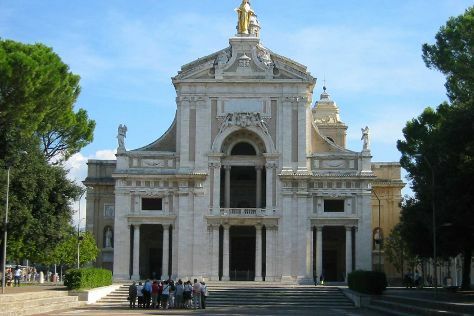 Cap off your sightseeing on the 7th (Tue) early enough to go by car to Assisi. Start off your visit on the 8th (Wed): contemplate in the serene atmosphere at Eremo delle Carceri, contemplate in the serene atmosphere at Basilica di Santa Maria degli Angeli - Porziuncola, then take in the architecture and atmosphere at Basilica inferiore di San Francesco d'Assisi, then contemplate the long history of Basilica di Santa Chiara, and finally take in the spiritual surroundings of San Damiano. To find photos, other places to visit, ratings, and tourist information, read Assisi road trip planning site . Traveling by car from Florence to Assisi takes 2.5 hours. Alternatively, you can take a train. Expect a daytime high around 26°C in May, and nighttime lows around 13°C. Finish up your sightseeing early on the 8th (Wed) so you can go by car to Rome. Get some cultural insight at Palatine Hill and Vatican Museums. Museum-lovers will get to explore Galleria Borghese and Sistine Chapel. And it doesn't end there: don't miss a visit to Piazza Navona, admire the landmark architecture of Pantheon, steep yourself in history at Roman Forum, and pause for some serene contemplation at St. Peter's Basilica. For ratings, where to stay, maps, and more tourist information, you can read our Rome trip tool . Traveling by car from Assisi to Rome takes 2.5 hours. Alternatively, you can take a train; or take a bus. Traveling from Assisi in May, plan for somewhat warmer nights in Rome, with lows around 17°C. Cap off your sightseeing on the 11th (Sat) early enough to travel back home. On the 12th (Sun), hike along Sentiero Adolf Munkel e l'Alpe di Funes, then get a sense of history and politics at Palazzo Municipale, then make a trip to Chiostro della Cattedrale, and finally explore the historical opulence of Castel Trostburg. Get ready for a full day of sightseeing on the next day: hike along Naturpark Schlern-Rosengarten. For where to stay, ratings, traveler tips, and other tourist information, read our Nova Levante driving holiday tool . Drive from Rome to Nova Levante in 6.5 hours. Alternatively, you can do a combination of train and bus; or do a combination of flight and bus. Traveling from Rome in May, Nova Levante is slightly colder at night with lows of 13°C. Wrap up your sightseeing by early afternoon on the 14th (Tue) to allow time for travel back home.